CATICOAT X is a deck slab waterproofing layer primer that has a greatly reduced drying time when used at low temperatures. In addition, it can also be applied as a primer for reflection crack absorbing sheets. 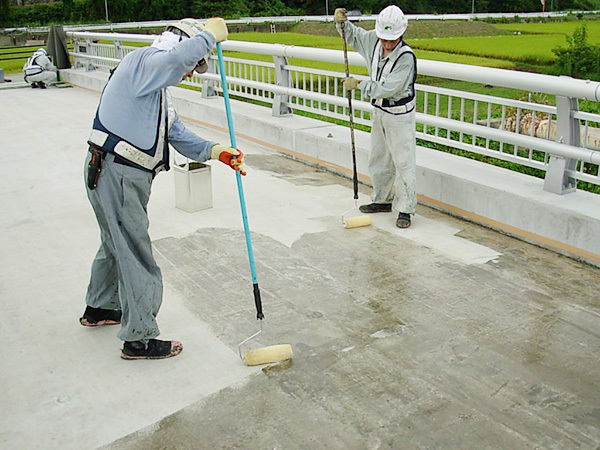 Conforms to the standard properties and conditions for solvent-based primers in the “Bridge Deck Slab Waterproofing Handbook” (Japan Road Association). Has quick-drying abilities even at low temperatures. Because it is transparent, it will not cause contamination of surrounding structures or road surfaces. Primer on concrete deck slab and steel deck plate for asphalt-based coating waterproofing membrane, asphalt based waterproofing sheet, and guss asphalt paving.